Click on the links to view sample pages from Chinese Gods. You will need a pdf reader to view these excerpts. Chinese folk religion is the underlying belief system of more than a billion Chinese people. Go into any Chinese home, office or restaurant and you will see altars, statues or paper ‘good luck’ images. And wherever there is a Chinese community there are temples and Earth God shrines. But what is the religion that makes sense of all these expressions of belief? How do these beliefs connect to Taoism, Confucianism and Buddhism? 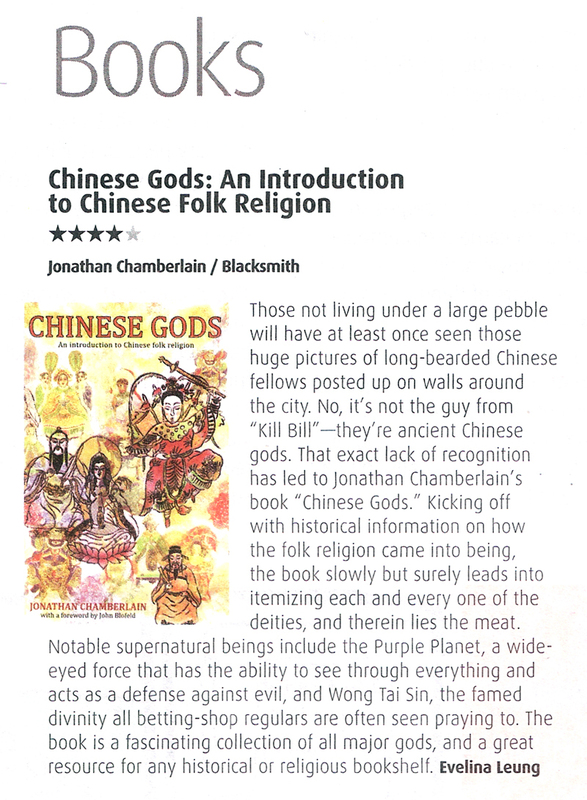 Chinese Gods helps us understand the building blocks of this religion for which even the Chinese have no name – because the beliefs are so intertwined with language and culture they have no independent existence – and provides an in-depth analysis of 19 of the major gods of the Chinese pantheon. “‘Writing is easy,‘ according to Red Smith, an American sports writer. ‘You just sit down in front of a typewriter and open a vein.‘ Some people just hate writing, others love it. For some, the words come out like breaking rocks and for others it trickles out of the pot like liquid honey – the words get everywhere but they’re formless and sticky.” Jonathan Chamberlain was asked how he writes by Time Out.